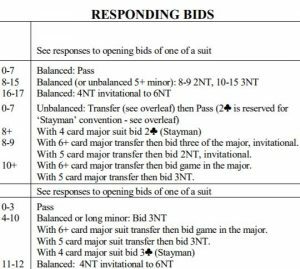 A bridge bidding cheat sheet is a very handy thing to have if you are a beginning or improving bridge player. It’s especially handy if you enjoy playing bridge online – either against robots or against real partners. 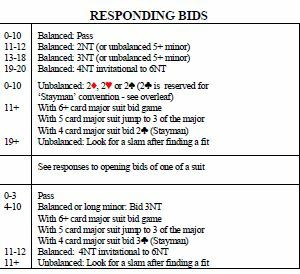 Print out the bridge bidding chart and keep it with you when you are playing, then you can quickly and easily look to see what your next bid should be. In time you’ll find you use it less and less as you gain confidence and memorise the bids and points ranges. At No Fear Bridge UK you will find a very comprehensive Acol bridge bidding cheat sheet which has ALL the information you need contained on just two pages – making it quick and easy to consult and find the right bid for your hand. As you can see, all the information you need is laid out in and easy to follow form on this bridge bidding chart and you can quickly and easily find out the right bid to make in almost any situation. At No Fear Bridge US you will find the American Standard Bridge version of the cheat sheet. If you are an American Standard bridge player – click here to join No Fear Bridge US for the American Standard cheat sheet. « Learn How To Play Bridge	» How Do You Play Bridge? For beginners these sheets/cards have a definite value – provided that players realise that, as they progress, they should be committing the stuff on them to memory. However, as they progress e.g. by learning through lessons etc, they will want to update their cheat/crib sheets. Can you tell me please of somewhere which would (i) design such a sheet to accommodate a person’s content preference, and (ii) keep that content of file so that it can be updated at the person’s request? Sorry James, I can’t think of anywhere that does that. Perhaps it’s something you could do yourself using a spreadsheet?